Embellish a simple two-layer cake for loved ones. LOVE means never having to fuss over a Valentine’s Day dessert. It doesn’t mean ignoring the holiday’s sweet factor. 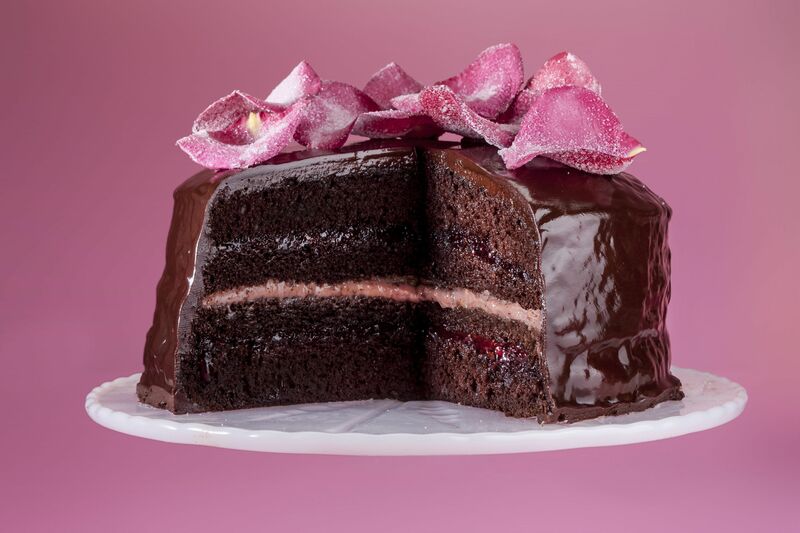 Instead, take a basic chocolate cake and embellish it with pointers from a pastry pro, someone like Alice Medrich, author of Seriously Bitter Sweet. “If you’re a pastry chef, you have this mental pantry of all kinds of cakes,” Medrich said. Think sponge cakes, butter cakes. And fillings, perhaps jam or a tart fruit curd, a mousse or whipped cream. And finishes, of course, a frosting or glaze plus a bit of decoration, say heart-shaped cookies or a stencilled dusting of icing sugar. Home bakers may not have a huge mental pantry, but they “do have some things that are tried-and-true that you love to make,” she says. You might take elements of those desserts and combine them in a new way. “Plan the construction of the layers, flavours and textures so that when everything is put together, the result looks spectacular and tastes even better,” wrote Medrich. Begin by baking a two-layer chocolate cake (a favourite recipe or a cake mix) or buying unfrosted layers from a bakery. Then choose one of the approaches here that suits your culinary skills. Skill level: You can handle a knife, a narrow spatula and own a whisk or electric mixer. Spread: Place one cake layer on a serving plate. Spread with a fruit preserve, such as strawberry. Top with second cake layer. Frost: Whip 1 cup heavy cream with 1 tablespoon sugar. Frost top with the whipped cream. Use a spatula or spoon to create decorative peaks. Finish: Dip strawberry tips in melted chocolate. Let chocolate set. Place strawberries, tip up, in whipped cream. Skill level: You have an electric mixer (or muscles enough) for whipping butter with icing sugar and flavourings. You’ll need: Your favourite basic vanilla buttercream frosting (or coffee-flavoured or tinted pink), chopped glazed pecans or walnuts, chocolate curls. Spread: Place bottom layer on a serving plate. Spread with frosting. Sprinkle with chopped glazed nuts. Add top layer. Crumb coat: Coat top and sides of cake with a thin layer of frosting; let rest. Frost top and sides of cake. Smooth. Finish: Place chopped glazed nuts in a bowl. Hold frosted cake over bowl and carefully pat small handfuls of nuts onto sides of cake. Place chocolate curls atop cake. If you like, arrange a few whole glazed nuts on top. Skill level: You’re comfortable in the kitchen, know where to buy organic food-safe rose petals and are game to candy them (or know where to buy them already candied). You’ll need: Fruit curd, fruit preserves, ganache (recipe below), candied rose petals. Slice: Each cake layer in half horizontally to make four layers. Place bottom layer on a serving plate. Spread: Spread with ganache, the consistency of soft frosting, or fruit preserves. Add a cake layer. Spread with a fruit curd. (We used lingonberry.) Add another cake layer and spread with ganache or preserves. Top with remaining cake layer. Crumb coat: Cool ganache to a soft frosting consistency. Use to coat top and sides of the cake. Chill to set. Finish: Once crumb coat is set, gently heat ganache to glaze consistency. Pour over cake and spread over sides. As glaze begins to set, do not continue spreading, or it will look dull, Medrich says. Arrange candied rose petals on top (see finished cake at the top of the page). Adapted from Alice Medrich’s Seriously Bitter Sweet (Artisan). Poured warm, it’s a glaze. Cooled, it can be slathered on as a frosting. Chop 225g of 54% to 60% chocolate into small pieces; place in a medium bowl. Heat ¾ cup whipping cream (plus extra as necessary) to a simmer. Immediately pour over the chocolate. Stir briskly until chocolate is melted and smooth. If glaze is too thick or looks curdled, stir in a little extra cream. Taste; consider adding a pinch of salt.